Sir Isaac Newton's Philosophiae Naturalis Principia Mathematica ("Mathematical Principles of Natural Philosophy"), popularly known as the Principia, is considered one of the most important works in the history of science. The Principia, wherein Newton formulated the three laws of motion and the law of universal gravitation, is the basis of modern physics and astronomy. Albert Einstein declared Principia to be "perhaps the greatest intellectual stride that it has ever been granted to any man to make." Our personal copy is a bit dog-eared because we think it makes for great bed-time reading. 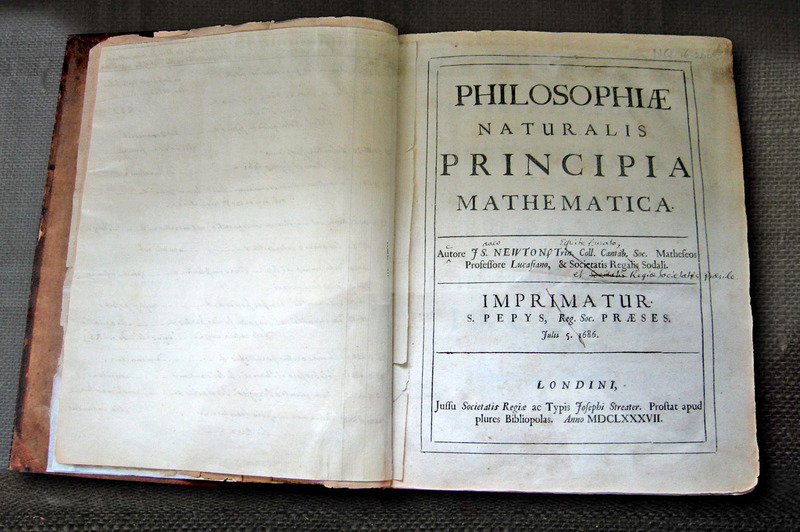 Two hundred and fifty copies of the Principia were printed in 1687, and ome of those first editions survived today. Newton's personal copy (along with his notes for changes to the second edition) can be seen at the Wren Library of Trinity College, Cambridge UK. In January of 2010, Boston College acquire a first edition of the Principia. It is currently on display at the Burns Library at BC. We contacted the folks at the Burns Library and they were gracious enough to allow us to stop by and take some photos. The Burns Library is a beautiful building on the Boston College campus. The library is named after the Honorable John. J. Burns (1901 to 1957), Massachusetts Superior Court Justice and a member of the Boston College Class of 1921. The library is home to more than 150,000 volumes, some 15 million manuscripts and other important works, including a world-renowned collection of Irish literature. A rare facsimile of the Book of Kells is on public display in the library's Irish Room, and each day the open page of the illuminated manuscript is turned to the next one. Currently on exhibit in the Thompson Room is Scientific Revolutions: An Exhibition of Early Scientific Works. This exhibit features a first edition of Sir Isaac Newton's Principia (1687) and works by Kircher, Schott, Copernicus, Galileo,and others. The books were selected for their unique contributions to scientific discourse. From Kircher's fantastic voyage through the heavens to Copernicus's heliocentric model of the universe, they all shed some light on the scientific thought and views from late 16th to the early 18th century. Being able to see these works is a rare treat for anyone, but especially for folks with an interest in astronomy. Newton sought to understand the workings of the universe through mathematics. He published the Principia in 1687 while he was a mathematics professor at Trinity College, Cambridge. His formulation of the laws of motion and gravitation helped to explain the movement of objects when a force acts upon them and are the foundation of the many branches of modern science (physics, astronomy, etc...). It was fascinating to be able to see first hand a copy of such a historically important book. Next to Kircher's book is an encyclopedia by Gaspar Schott with illustration sketches describing the six chief world systems: Ptolemaic, Platonic, Egyptian, Tychonic, Semi-Tychonic and Copernican. The Ptolemaic system has the earth as the center of the Universe; the Platonic system only differs from the Ptolemaic in the relative position of the Sun and inner planets. The third system, the Egyptian, was proposed by the 5th-century Roman African writer Martianus Capella. The Capellan, Tychonic and semi-Tychonic systems were geocentric, unlike the Copernican. In the Copernican system, all planets revolve around the Sun, and the Earth is included among the planets. At the end of the case is De Revolutionibus by Nicolaus Copernicus. It is the seminal work on the heliocentric theory which offered an alternative (an ultimately correct) explanation of the astronomical observations to Ptolemy's geocentric system. The Church attacked the heliocentric theory with Scripture and the common Aristotelian proofs, but in the end had to acknowledge Copernicus' theory in the face of overwhelming evidence. On display in another case in the library is The History and Demonstration Concerning Sunspots and Their Properties is a collection of letters describing Galileo's observation of sunspots through a telescope he invented. Through his study, Galileo deduced that the spots were solar activities and that the sun rotates on a fixed axis. This copy was donated to the Burns Library by Wega and Angelo Firenze.